A day of misdirection, I never get last when I know where I am going :-) However I'm not to familiar with the far off land known locally as the "East Bay". 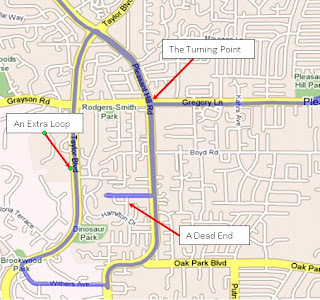 Getting to the ride start was my first first challenge of the day, the map I had printed off wasn't entirely clear on the street name where the final turn was not there causing me to miss the turn twice, a theme that would continue through the day. Just as I was getting even more confused I saw the team cycling away, unfortunately I was in the turning lane to get back on the freeway. Back on the freeway and some back tracking I was able to getting to the starting location just 15 minutes late, luckily there were still a few people there and I was able to get a map from the coach, so finally at 8:30am I was ready to start. The route was very detailed and I was determined not continue getting lost, the first few miles involved navigating through some city streets, things became a lot more straight forward when I reached Ygnacio Valley Road, I picked up the pace some and started catch with other late starters. From there I came on Marsh Road and alongside Mount Diablo State Park, starting worry about missing the next turn as I headed into the middle of now where, there was Coach Mike by the turn on to Morgan Territory Road. This where the ride started to get a lot more interesting. Morgan Territory Road, lead us into a shaded area which hide a multitude of dangers, in the form of pot holes. 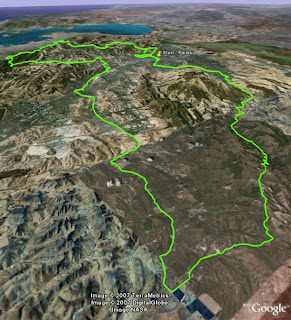 This was also the biggest single climb of the route with 1400 feet of climbing. 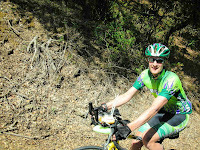 I started to see a lot more of my team mates as I continued up the hill. At the peak of the hill there was a very well placed support stop that gave needed chance to refuel. On the other side of the climb there was a stark contrast in scenery from a green and shaded climb to a open baron decent with just dried out grass covering the hills. The decent was fast but also very dangerous, around on of the corners there was a pick-up truck heading towards me, there was just enough space for us to pass safely but if I hadn't been so cautious I could easily been, let just say in the wrong place. At the bottom of the hill the road conditions were good it was rolling hills towards Danville, although it was every open and I did encounter some head wind. Back in to town again I had to be more careful when it came to following the directions, as sure enough I quick made wrong turn leading me to a dead end. Instead continue on San Ramon Valley Blvd (which was to become Hartz Ave), I turned on right on Hartz Ave leading me in the wrong direction, however was a minor course correction, that only cost me a couple minutes. Back on the route I ran into a couple of the North Bay Ironteamers, so for a short time I had some sense of where I was going. We turned off Danville Road, to Hill Grade road a short but steep climb on a appropriately name road. It wasn't too long before we hit next support stop, which was well stock if a variety of food and classic assortment beverages (water and Gatorade). At was at this point as I realized there was still on heck of a long way left to go and the next section took us off the road on to a cycle path. This was one of the most frustrating parts of the ride, the cycle path had pedestrians and generally felt slow going. It wasn't too long before I was off the cycle path and back on the road again heading out of town toward the next major climb of the ride. The climb took me into the Redwood regional park, which offered some great views, after a fairly short climb I descended in a very nice wooded and shady area. Of course every good downhill is followed by an uphill this would continue for sometime. When I reached Skyline Blvd. up behind Oakland the climbing got a lot steeper but the views became more rewarding. After a little while on Skyline it started to level out with a few rollers. I started to make a few stops along the way to capture a few shots. After Skyline I descend back towards Pleasant Hill where we started, there was one last support stop which gave me some needed supplies. From there it was just a matter of getting across the last set of mountains in m way known as the the Grizzles, Papa Bear, Mama Bear and Baby Bear. While none the three climbs were that bad on a individual basis, put all together on mile 80 and there is some serious work to. With the all the climbs behind me at mile 97 there was not much further to go and I was ready to finish, it had been a long day and a hot one. However it was not end this quickly, I missed a wrong turn and found myself heading in the wrong direction, I caught the mistake fairly quickly and turned back after just a couple of miles. Once I reached the point diverted from the course I ran into another teammate from the North Bay who was also deciding on which way to go. She thought I had gone the right way but missed another turn up head. Willing to believe I was on the right track originally I followed her lead, this time we ended up going 3 miles out before deciding to turn back. Finally on the right track again and just 5 miles away from the finish, I increased what had become a slow pace and headed back into town. I was doing well right up until the last turn, now just less 2 miles away from the end, I had no idea I spend the next 45 mins going in circles. I was at the junction for the last turn and nearly got it right but when I looked at the sign it "Grayson Rd" instead of "Gregory Rd", so I continued past the turn and for a couple miles. I then did a U-turn to correct my course and then went past the correct turn again and made a left onto Taylor thinking I misread a now barely readable set of directions, after another few miles I found myself looping back onto the road I had just left. By this point I was losing hope, I had already gone 15 miles over the actually route and it was getting late in the day. I decided to called the Coach Mike and tell him I was lost, I explained where I was he pointed me in the right direction. Going back along the road I been on several times, I came across the final junction for the third time, alas I looked up and there was the sign, I had not notice that the road was "Grayson" in one direction and "Gregory" in the other. I made the final turn and sure enough I was at the end in no time. I explained my directionally challenged day some of my teammates and confirmed that the Ironman Canada course would be well marked.